Let me start by saying that I'm not by nature a baker. I know how to bake, and I like to bake, and I have several long-time standards and I'm not afraid to try something new, but I've never been one to innovate in the kitchen when it comes to cookies, cakes, or pastries. The potential for disaster, both in taste and in chemical reactions that may result in explosions that leave bits and blobs of batter dripping from every conceivable surface of my kitchen, has long prevented me from mixing and matching in the cake and cookie department. Which is one of the reasons I have not participated in any online baking events. I just don't usually have that urge to get creative with cookies. But when I saw the truffle that Danielle of Habeas Brulee made for last month's Sugar High Friday, and that she was hosting this month's event, something started brewing inside me and I decided that it was time for me to overcome my fear of improvisational baking. I originally thought I would do something with cacao nibs since I've been so obsessed with them lately, but nothing came to mind so I tabled that idea and decided to let it percolate around in my head for a while until I could come up with something. Then with the holidays coming, I started thinking about what I wanted to bake. There are a couple of recipes that have become sort of traditional over the years. 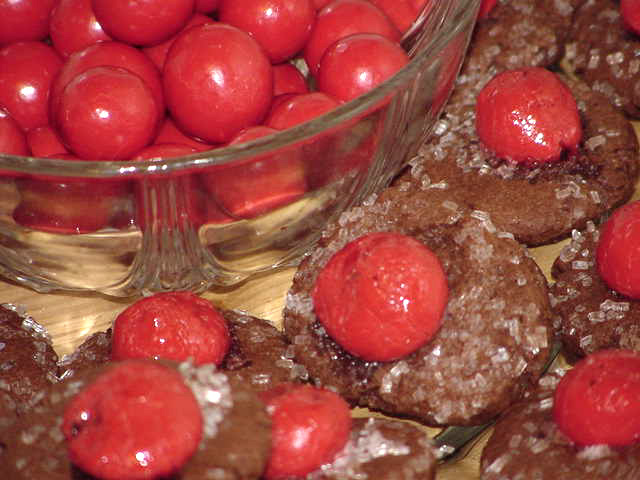 I wrote about Mexican Wine Cookies here. They don't look like much and their flavor is subtle, but when made with good ingredients they are incredibly addictive and impossible to resist. So when I started thinking about making them this year, I was also trying to think of something creative I could do. I decided to add cocoa to the cookies and everything kind of took off from there. The first challenge was finding the right amount of cocoa to substitute. This recipe has a high flour-to-butter ratio, so I figured 3-to-1 would be good. 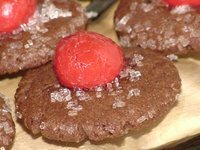 The original recipe calls for sweet sherry, which has a nutty flavor that permeates the cookies and is what makes them so addictive, in my opinion, but I didn't think that flavor would go as well with the cocoa. I was going to use Kahlua, but my attention was caught by Godiva Liqueur at the store so I went with that instead. After I made up the recipe, I divided the dough so I could try different things with it. The first time, I just dotted them with a little decorative sugar and baked them. They were ok (and by that I mean nothing exploded in the oven), but a little bland. There wasn't enough body to the liqueur to add anything to the flavor. They needed something more. And then I remembered the Pomegranate Cordials I had seen at Treasure Island down the street. They looked really good and I really wanted to try them but I was trying not to eat too many sweets and I was already being forced to eat the results of my baking experiments so I decided to pass them up. So maybe it was because I really really wanted to eat them that I came up with the idea of putting them on the cookies. Whatever the reason, it was a good one. I wasn't sure if the cordials would hold their shape in the heat or if they would just melt over them and burn on the bottom of my oven, so I rolled out one little cookie, pressed in a cordial, and baked it all by its lonesome little self. Imagine my pleasure when it held its shape and stayed on top of the cookie. So I baked up the rest. How were they? I thought they were pretty good, but I wasn't sure if anybody else would think they were. I was going to see Lynda right before I left for Austin for the holidays so I took some to her and she was nice enough to try one right away, and she said it was good. I also brought some to my knitting student Nicole to try and she liked it, so I was feeling pretty good about how they turned out. I took the rest of them to Austin with me so I could test them on my harshest critics - my family. They said they liked them, and the rest of the cookies disappeared quickly enough, so I guess they were a hit. I plan to play with this recipe some more. And thanks to Danielle and this event, I think I've finally caught the baking bug. Cream butter and sugar. Add egg and beat until light and fluffy. Blend in salt and 2 cups flour. Stir in liqueur. Add remaining flour and the cocoa; mix well. Chill dough at least one hour. Roll dough into walnut-sized balls and place on cookie sheet. Grease the bottom of a 3-inch glass and dip it in decorator sugar, then flatten each cookie. Gently press a cordial into the center of each one. Makes about 8 dozen cookies. Wow, if this is what you make when you first catch the baking bug, I am at the edge of my seat with anticipation to see what you make later on. This looks incredible! Pomegranate plus Godiva liquor - yum! Aw shucks, Danielle, I'm blushing. This really was fun. I'm eager to try my hand at more experiments, but they will have to wait a little while after the Christmas sweet-frenzy I just went through. In years to come it will be known as the "Great Christmas Feeding Frenzy of Aught-Six." So no more goodies for me, for a little while at least! Just the picture of these went to my head and I became dizzy....don't they look good? What a great combination, I'd love to try one of these! Thank you Holly and Brilynn. They're surprisingly easy to make, and a lot of fun!